A perfectly level table is key to any cutting or engraving project. Here we'll show you how to check your table level and adjust as necessary. With your machine on, open the top door so you can have full access to the table. Disable the X and Y axis motors so you will be able to manually move the carriage by hand over the entire table. To do this, press the X/Y OFF button and then press the GO button. Locate manual focus gauge. This is a triangular or “V” shaped tool shown to the right. 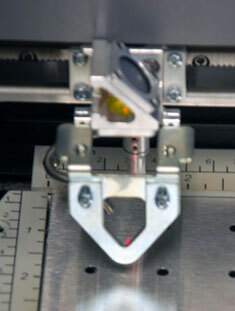 Place the gauge on the lens carriage as if you are going to manually focus the machine. Adjust the table until it just touches the very bottom tip of the focus gauge. Move the lens carriage to all four corners to visually inspect the distance between the focus gauge and the table. If the gauge moves up or the spacing between the gauge and the table increases, this would indicate the table is not level and will need to be adjusted. If you find the table is not level and needs to be adjusted, please continue on with the “Leveling Table” procedure. It is likely that the table is higher or lower in one corner – begin leveling the table in the corner you find higher or lower than the rest. There is a maximum of about 3/8” adjustment per screw. To adjust a corner of the table up or down: Move the carriage (with the focus gauge in place) to the corner to be adjusted. Loosen the lock screw (the screw with the lock washer) to take the tension off of the table. To raise the corner: Turn the adjustment screw in a clockwise direction until the table comes up and touches the focus gauge. To lower the corner: Turn the adjustment screw counter-clockwise until the focus gauge just touches the table. After raising or lowering the corner of the table, tighten the lock screw. Adjust each corner as needed until the focus gauge just touches the table at all four corners. NOTE: Turning the adjustment screws one full revolution will move the table 1/32” (0.8 mm). 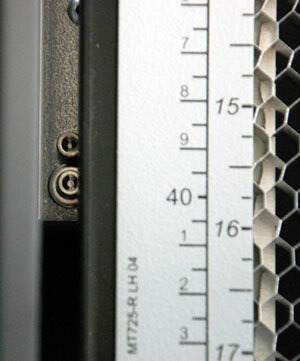 Notice the two screws beside the ruler - the top is the adjustment screw and the bottom is the lock screw. If you have any questions, please contact Epilog’s Technical Support team.